We are almost yearly involved with the Town’s Earth Day activities, often collaborating with the Wayland Green Team to organize. For Earth Day 2016, please go here. Have we got a treat for you this year. Earth Day 2015 will be all about dirt so dark, so crumbly and rich you just want it under your fingernails! But if not, the next best thing would be to help us promote local, small-scale farming and gardening. On Saturday April 18, join us in the Community Garden or on a walk (schedule coming soon). Until then, we will have an article on our theme in each week’s Wayland Town Crier, starting as of 2/26. TW has been involved in Wayland’s Earth Day celebrations since 2012 (to read about the 2012 Earth Day, check here). Below: wrap-up article, list of articles in the local press, official invitation, maps and schedules. On April 26, 27 and 28, households, businesses, schools and houses of worship hosted Open Houses. It was a resounding success with OVER 600 VISITS to 34 Open House events! 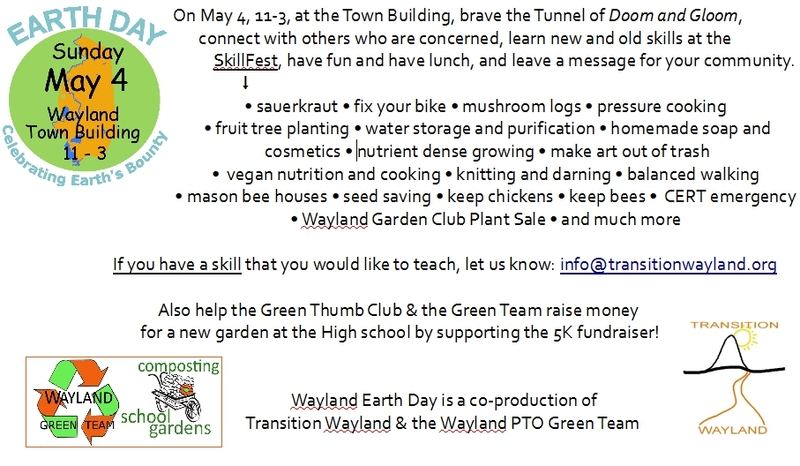 Transition Wayland and the Wayland Schools PTO Green Team would like to thank all the hosts, visitors, sponsors and volunteers for making Wayland’s latest Earth Day event a resounding success. Last year the two organizations put up a traditional fair with booths and activities behind Town Building. Though that too was by all counts a success (400 visitors), they wanted to try something different this year. The goal was to “give Earth Day away” to the community by decentralizing it. They came up with the idea of open houses, open gardens, places of worship and businesses, where things sustainable, resilient and “green” are happening, though not always known to residents. The invitation to the community elicited a much larger response than they had anticipated. By the April 1 deadline, the schedule counted thirty-four events all over town, north to south, east to west. Some houses offered to be open for two hours, one for twelve, and many opened on both days. It’s a good thing it was an Earth Day weekend, because all of it would not have fit into one day. As it was, it was a challenge to fit all of them onto the flier, the printing of which was generously sponsored by Maple Hill Architects (Doug Sacra, aka the Wayland Town Crier’s “Green Guy”) and Tempietto Homes (Win Mallett of Toaster House fame). Other publicity included an eleven-week article series in the local press and (re-used) lawn sign invitations coming up by roadsides. Hosts had prepared tours and handouts of their houses old and new, designed, built or retrofitted for green living, their geothermal systems and lots of solar, mostly photovoltaic but also hot water. Claypit Hill and Happy Hollow showed off their gardens, composting and rainwater catchment. Visitors came to stroll private vegetable and herb gardens, take home seedlings and perennials and try dandelion fritters and pine needle tea. Girl Scouts and BASE offered children’s activities. There were horses to pet, bees to watch and baby chicks to hold. Stop and Shop and Whole Foods offered goodies to customers bringing in their maps, and Russell’s Garden Center gave tours of their greenhouses and solar array. Trinitarian and Peace Lutheran welcomed visitors to their efficient buildings and solar PV, respectively. Fireseed Arts invited people to play electric guitars and other instruments made from trash, and the Transfer Station offered a Conservation Committee booth, and free compost. Mainstone farm put its band saw into action and Forty Acres Drive welcomed test drivers for three fuel-efficient cars. All together, these events received over 600 visits, some from friends and neighbors, many from welcome strangers. There were even people looking to move to Wayland and using this event as a way to explore the town and meet the people. Needless to say, they were impressed. The sunny weather helped walking and biking. In the end the two organizations could not resist holding one centralized event. The choice of showing Chasing Ice, which made waves earlier in the year in theaters around the world, was an easy one. Thanks to Stop and Shop, who generously sponsored the purchase of the screening rights, and the High School, who hosted it, over fifty visitors watched this breath-taking documentary. It was one of the first grass-roots screenings in the US – in fact, the DVD had arrived in Wayland just the day before. The mission of the Wayland Earth Day is to unite the community in a broad conversation about sustainable living and climate change. On the weekend of April 27 and 28, 2013, households, businesses, schools and houses of worship all over Town will host Open Houses. Below you can find our annotated map and below that a . Click here for the navigable Google map. Click here for a printable schedule. A breath-taking documentary of James Balog’s mission to gather undeniable evidence of climate change. With a band of young adventurers, Balog deployed revolutionary time-lapse cameras across the brutal Arctic to capture a multi-year record of the world’s changing glaciers. Wayland High School, Lecture Hall. Suggested donation: $7. Take a look around, buy compost bins and take home free, limited quantities of wonderful compost — bring buckets, bags or bins. Take It or Leave It opens for tag-holders only. Tempietto Homes’ LEED Gold house, 2012 national finalist for LEED “New Home of the Year.” Demonstrates the aesthetic and spatial freedom available in the new sustainable materials with solar panels. Doug Sacra shows his pole-mounted 9 KW photovoltaic system which serves his house and Maple Hill Architects office. The sky-lit kitchen and eating area are bright, morning to sunset. Book sale greens Wayland by recycling used books! Complete passive and active solar house. All glass south wall, insulated walls elsewhere. Pellet stove and gas backup. New solar PV system. Riding center specializing in horsemanship and riding lessons for children with special needs. Visit horses and stables. See a demonstration of a bandsaw mill and the utilization of a variety of logs for lumber and other projects around the farm. Presentations about storm water, trails and community gardens. Local Day. Taste the “local” difference and support the local products. Bring your Earth Day map and get a free goodie! 11 AM, tour of solar installation. Also 11 AM, workshop on how to create rich and healthy garden compost. At 12:30 PM, meet Vegetable Dept for tour of greenhouses and certified organic vegetables, Q & A. Maple Hill Architects gives tour of – 28,000 s.f. addition, 7,000 s.f. renovation. Efficiency delivers 50% heating, 30% electrical savings. Waterless urinals, sensor faucets. Porous paving parking lot. Test drive an electric car and learn more about clean diesel, hybrid and hybrid electric. New green construction and energy retrofit. Addition built in an energy-efficient factory and delivered as pre-insulated panels. 60-year-old house encased in insulation, new windows and siding. New HVAC. Workshop on living in a sustainable, low maintenance home with a range of the best renewable technologies. Also: ultra low maintenance Pearl’s Premium seed for a lush, barefoot soft, deep green lawn. 4th grade Wayland CPH Girl Scout troop shows earth-friendly options for pet products and care at Claypit Hill. Donate to support Buddy Dog Humane Society. Buy homemade pet treats and toys. Help the Green Team plant blueberry bushes, seeds. Outdoor composting bins and indoor worm bins. Design crop markers. How to grow leaf crops this spring. Help make the morning glory trellis. Rita will let you hold chicks. She will talk about raising chickens, coop plans, and how they can run your compost pile. Small house for one: 5-star HERS, low-e windows, heat recovery ventilator, passive & PV solar, radiant heat, no dryer. Learn to build a compost tumbler: plans provided. Visit the garden, enjoy wild harvest goodies. Walk paths between plots, enjoying spiritual messages along the way. Bring a container and take home perennial plants or seeds. In-home screening of the movie Green Fire: A Land Ethic for our Time about the life and work of Aldo Leopold, and conversation afterward. 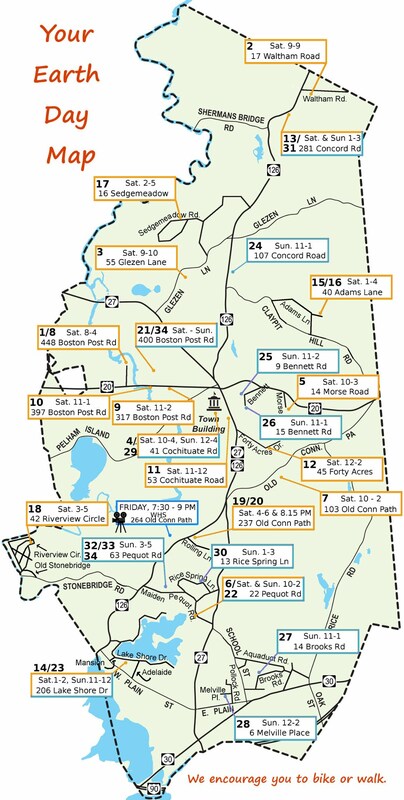 Bring your map to Stop&Shop Wayland and get a free reusable bag. Members of Peace Lutheran Church invite you to come and see the solar installation on the roof of their church. Molly Faulkner will demonstrate three different ways to compost food scraps, in and outdoors. Find out how the new solar panels work. Chat with neighbors, enjoy vegetarian refreshments, watch a short movie and join the discussion: How can we become more resilient in the face of climate change? Join FireSeed Arts at Happy Hollow for an Eco-Art Lab and reclaim, repurpose and transform havested trash into objects of beauty and contemplation for awareness of consumption in our society.